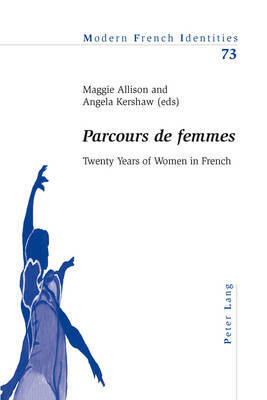 This collection of essays celebrates twenty years of Women in French, a network of female academics working in the discipline of French Studies. Based on papers delivered at the group's tenth biennial conference in Leeds, which was entitled `Le parcours', the volume investigates the theme of trajectories in French and Francophone women's lives and writings. The book begins with consideration of the ways in which traces of women's lives, experiences and texts are conserved in archives and communicated to new generations of readers through the practice of women's biography. It then addresses the presence of women in public spaces such as journalism, politics and the street. The volume goes on to examine women's representations in literary space and their use of imaginative writing to depict, interrogate and transform their life trajectories. It considers women's movements through geographical space, looking at the intersections between gender and travel. With the inclusion of essays from a range of disciplinary perspectives, the volume highlights the variety of French and Francophone women's contributions to society, culture and politics as well as celebrating the diversity of women's contributions to the discipline of French Studies in the United Kingdom, Canada, Australia and Europe.